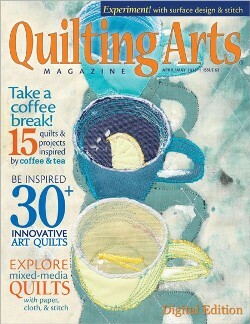 Join artists from around the world as they bring innovation to quilt design with their favorite beverages--coffee and tea. With more than 15 quilts and projects, you'll be inspired to join in the fun. Also discover: Artist Holly McLean as she shares her methods for creating painted shibori fabric Teri Lucas who will show you how to take the mystery out of stitching with faux suede How to add stitch to a mixed-media collage with Leslie Tucker Jennison. This is a PRINTED magazine, not a download as the photo shows.